A plateful of piping hot something is not a particularly inviting idea in this smouldering heat. But just think of someone talking about samosa all over twitter and facebook and the husband has already demanded a keema paratha you would definitely be tempeted to some heat and deep frying. 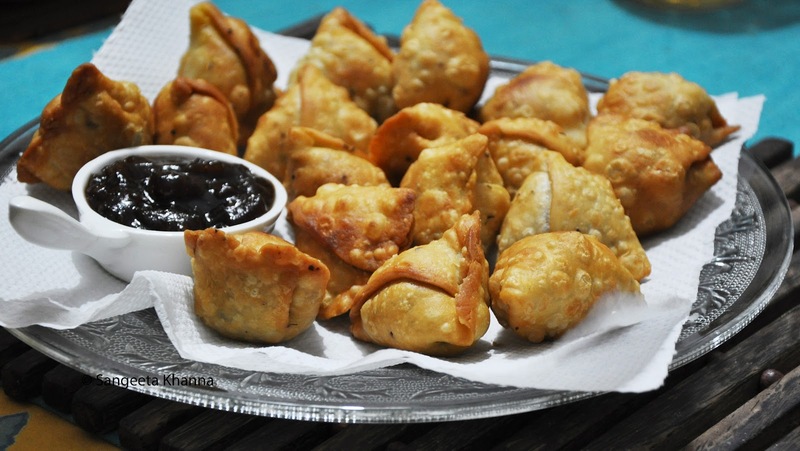 So a friend was talking about baked samosa that I find awful to be honest because the fat in the shortening of pastry dough would not be any less if you want a crisp pastry on samosa. Why not deep fry it because anyway you have them very occasionally only. And then I decided for a Keema samosa dinner that day. Any such heavy snack becomes a dinner for us always. I had this Khajur Imli ki chutney in the fridge and the Samosa took me about 40 minutes from scratch. Heat ghee in a kadai and tip in the cumin seeds. Wait till the cumin seeds crackle and then throw in the garlic, ginger and then the chopped onion in that order. Fry till pinkish brown, adding salt at this stage would help in hastening the process.. Tip in the powdered spices , mix and then add the mutton mince. Mix and keep stirring. It takes about 15 minutes to get cooked and dry. Cook longer if the keema (mince) is coarse. Check seasoning, adjust and let it cool. Mix maida, salt and ajwain seeds. Rub in the ghee and mix well. Add water and make a firm dough. Make 10 portions out of the dough and roll out small discs. Halve the discs in half moons and make a cone with each semi circle, folding the straight side up. 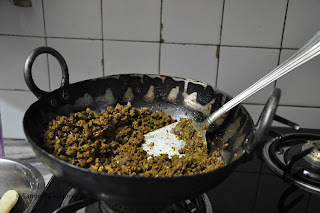 Then stuff the keema inside , crinkle the edges and seal with pressure. Repeat with all the discs..
My little trick to flash fry the samosa is to microwave a batch of samosas placed on a greased plate first for 2 minutes and then dunk them immediately in hot ghee so they get fried in minimal time and come out as crisp as the street side shops or college canteens. Did you check out the samose I saw live demo almost daily while in university and tried making them later? Those are the real potato stuffing samosa that is a college time favorite of all Indian students I guess. 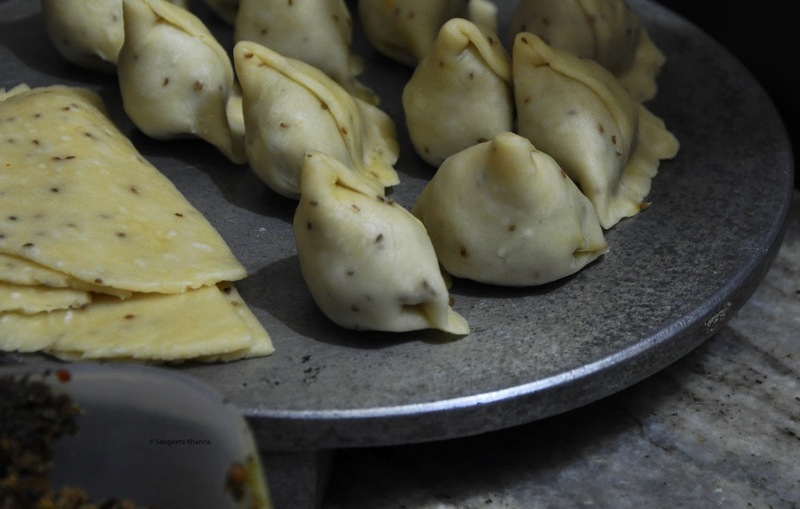 These keema samosa are more of a specialty of a few places and mostly are made at home because very few people trust the meat at street shops. They are best home made. The khajoor imli ki chutney was perfect with the spicy heavy stuffing. We had our dinner earlier than normal that day and it was worth having a deep fried indulgence in a hot summer day. These are small samosa almost the size of Indian limes. The reason I make them small is that I have to fill the pan less for deep frying them. Bigger samosa would need deeper oil/ghee to deep fry. Reusing the ghee is not harmful because of high smoking point and more stable fatty acids but if you are using other cooking oils you must be careful about reusing the oil. Using lesser in the frying pan makes sense. Smaller samosa are cuter and crisp too. Do you see that dark and thick khajoor imli ki chutney? That bowl was licked clean. We had some samosas as leftovers the next day with tea. Reheated in MW they were not as crisp as fresh but as tasty. 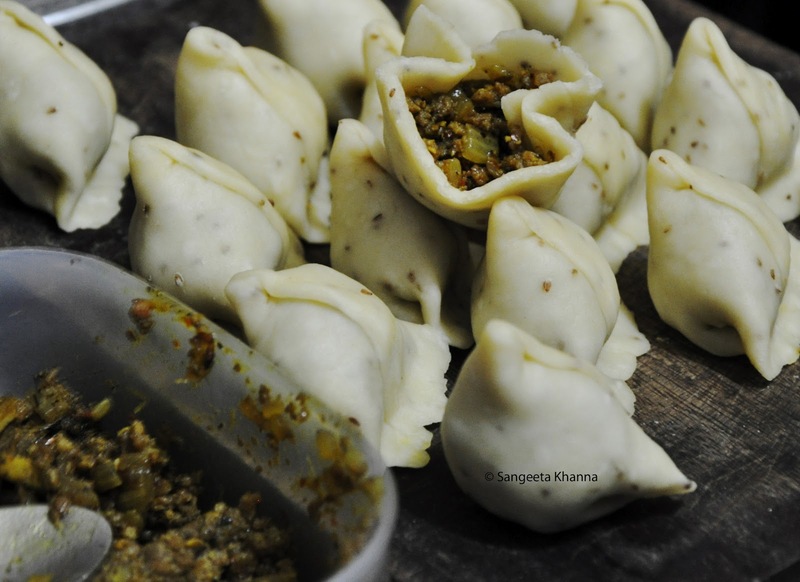 Those who love keema would know how leftovers are guarded with utmost care. 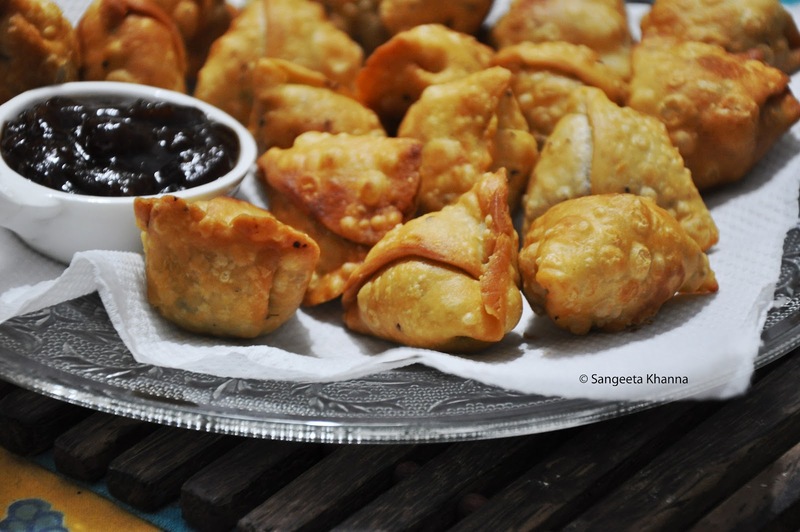 How often do you have such fried goodies as your dinner? Sangeeta, they look delicious! How did you manage to cook in the Delhi heat? 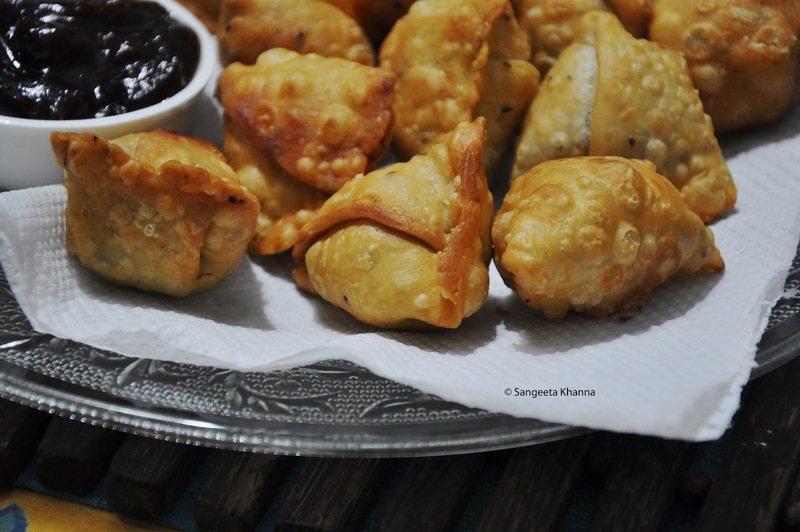 You've got me craving for these samosas now... My MIL made cutlets with mutton keema just last week.. the keema was cooked more or less with similar spices. I can tell how great it'll go in the samosa! These look absolutely perfect!